Genesis 1:1-5 (KJV) – In the beginning God created the heaven and the earth. And the earth was without form, and void; and darkness was upon the face of the deep. And the Spirit of God moved upon the face of the waters. And God said, Let there be light: and there was light. And God saw the light, that it was good: and God divided the light from the darkness. And God called the light Day, and the darkness he called Night. And the evening and the morning were the first day. The very first sentence of scripture declares “In the beginning God”! Before anything there was God. Many people do not believe that statement in Genesis 1:1. They refuse to believe that in the beginning there was God. A God that created the heaven and earth out of nothing. Scripture states that God spoke everything into existence. God spoke light into existence as His first creative act. Light was created on the first day. We have been led to believe that scientists do not believe in God or the Bible. I do not believe this is correct, as many scientists have been and are Bible believers. What’s interesting is that most science books are obsolete as soon as they are printed! I believe that science, properly applied and understood, proves the Bible is an inspired book. Moreover, while the Bible is not a science book, it is accurate where it touches on scientific principles. This article, while not exhaustive, explores the relationship between science and scripture. Take a close look at Genesis 1:1, the scientific principles are right there! God established all the laws of nature. Our creator has instilled in man the desire to question how these laws operate and the intelligence to live with their boundaries. When conducting scientific research, everything is a theory until proven by the scientific method. First, there’s a theory. Then the theory is tested. Measurements are taken, and data is collected. What conclusions do the measurements lead to? Are the results of the tests reproducible? When the tests do not yield the same results every time, then it is an unprovable theory. It cannot be considered a scientific law. One notable example of a scientific theory is evolution. Evolution is only a theory. To date, no scientific investigation has proven the theory of evolution. So, since the theory of Evolution has not been proven then what we should conclude is that it is a belief system. The Bible, of course, has a lot to say regarding the origin of life on this planet. Christians can use science to study and understand God’s creation. Job 26:7-8 (KJV) – He stretcheth out the north over the empty place, and hangeth the earth upon nothing. He bindeth up the waters in his thick clouds; and the cloud is not rent under them. About 4,000 years ago, through divine revelation, Job knew that the Earth was not supported by a giant turtle or rested on the shoulders of Atlas. Here in Job chapter 26, a reference is made to the water cycle of evaporation and condensation which forms clouds. What Job wrote nearly 4,000 years ago is scientifically accurate. Job 36:27-28 (KJV) – For he maketh small the drops of water: they pour down rain according to the vapour thereof, Which the clouds do drop and distil upon man abundantly. Then in Job chapter 29, we read about precipitation (rain) and the water cycle. Job 28:25 (KJV) To make the weight for the winds; and he weigheth the waters by measure. The wind has weight! Wind is air in motion – it has weight! The fact that air has weight is settled science. It is the weight of air that can cause untold destruction during severe weather events such as hurricanes and tornadoes. Daniel 1:4 (KJV) – Children in whom was no blemish, but well favoured, and skilful in all wisdom, and cunning in knowledge, and understanding science, and such as had ability in them to stand in the king’s palace, and whom they might teach the learning and the tongue of the Chaldeans. We find references to “science” in both the Old and New Testaments. The word “science,” interesting enough is found in our Bibles. However, don’t get too hung up on the word “science” because it simply means knowledge. Sir Isaac Newton was a revolutionary mathematician, astronomer, and physicist, who has been praised as one of the greatest scientists of all times. He has been called “the greatest scientific genius the world has known.” However, this scientific genius spent less time on science than on theology. Newton’s understanding of God came primarily from the Bible, which he studied for days and weeks at a time. He took a special interest in miracles and prophecy! Sir Isaac Newton wrote extensive theological works such as “Observations Upon the Prophecies of Daniel,” and the “Apocalypse of St. John” – to name a few! 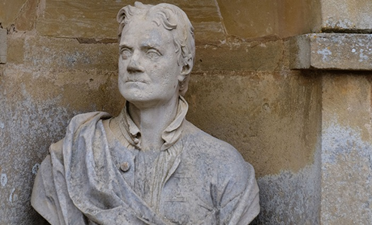 Newton wrote more about theology than he did science! God knows all things and has all knowledge. This knowledge is what is meant by the omniscience of God. As Creator of the heavens and the earth (Genesis 1:1), there is nothing made that He has not known (John 1:3). God knows how the universe works. Since God created all things, doesn’t it follow that He knows all things? The “all things” includes the reality in which we exist. 1 John 3:20 (KJV) For if our heart condemns us, God is greater than our heart, and knoweth all things. The Lord knows the exact number of hairs on our head. Moreover, He certainly knows our hearts! God’s omniscience includes knowledge of the future. God can see the beginning from the end. Isaiah 41:22-23 challenges other gods to “declare to us the things to come, tell us what the future holds, so we may know that you are gods.” Any god worth its salt must know the future. However, is that the case with the Baals, Dagons, and Molechs of this world? Romans 11:33-36 (KJV) – O the depth of the riches both of the wisdom and knowledge of God! how unsearchable are his judgments, and his ways past finding out! For who hath known the mind of the Lord? or who hath been his counsellor? Or who hath first given to him, and it shall be recompensed unto him again? For of him, and through him, and to him, are all things: to whom be glory forever. Amen. This awe-filled response should be the same for all of God’s followers. The more we understand who God is, the greater our awareness of His greatness. His perfect knowledge of all things is part of this understanding. We may not know much, but we know this: His understanding has no limits. The creation account found in the first chapter of Genesis starts with an earth that was “without form and void.” Dig into the Hebrew words for “form” and “void,” and you will see that the Almighty is conveying the idea of confusion and chaos. The word “void” means what you think it means – a void, nothingness. The creation goes from chaos to order; from darkness to light; from death to life, and from simple life forms to the more complex. Moreover, what’s of particular interest is that on the first day God created light. 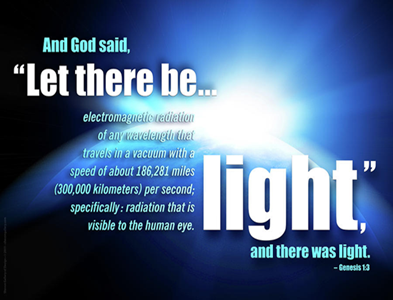 Genesis 1:3-5 (KJV) – And God said, Let there be light: and there was light. And God saw the light, that it was good: and God divided the light from the darkness. And God called the light Day, and the darkness he called Night. And the evening and the morning were the first day. Light is one of the most astonishing productions of the creative skill and power of God. It is the grand medium by which all his other works are discovered, examined, and understood. I would submit that light was the “clay” or building blocks that God used for the rest of His creation. Light, with its immense diffusion and extreme velocity, are alone sufficient to demonstrate the being and wisdom of God. Light has been proved by many experiments to travel in a vacuum at the astonishing rate of 194,188 miles in one! God created light – out of nothing! In Genesis 1:3 He spoke light into being. 1 John 1:5-7 (KJV) – This then is the message which we have heard of him, and declare unto you, that God is light, and in him is no darkness at all. If we say that we have fellowship with him, and walk in darkness, we lie, and do not the truth: But if wewalk in the light, as he is in the light, we have fellowship one with another, and the blood of Jesus Christ his Son cleanseth us from all sin. Before the creation of the sun and the moon, God stepped into the formless and empty darkness and brought light. Light certainly brings life, and that is what God wanted for His creation. The form created was not a lifeless form but a created masterpiece full of the richness of the Creator. Light On Day 1, Sun On Day 4? The Genesis account has been criticized on many fronts. The question that is often raised is this: In Genesis 1:3 it says “And God said let there be light and there was light.” It was day one. Then in Genesis 1:16 it says, “And God made two great lights; the greater light to rule the day, and the lesser light to rule the night: he made the stars also.” This was day four. What produced the “light” on day one if the sun wasn’t created until day four? Also, aren’t the evenings and morning determined by the rising and setting of the sun? However, if the sun was not created until the fourth day then what determined the days before that? The answer can be found in comparing the Hebrew language in Genesis 1:3 with that found in Genesis 1:16. Genesis 1:3 (KJV) – And God said, Let there be light (owr): and there was light (owr). Genesis 1:16 (KJV) – And God made two great lights (mowr); the greater light (mowr) to rule the day, and the lesser light (mowr) to rule the night: he made the stars also. In Genesis 1:3, the word for light is owr (oar) which means light. In Genesis 1:16 it’s mowr (ma oar) which is a light repository. The literal translation is a candlestick or chandelier. So, God created the light on day one and separated it from the darkness, permitting the distinction between day and night. Then He gathered the light into one location (the Sun) on day four, where it has been ever since. Evenings and mornings are not created by the rising and setting of the Sun but by the rotation of the earth! Also, the term evening and morning represents going from darkness to light or moving from something that is without form to something that has form. What exactly did God create on the first day? What is light? Light is that part of the electromagnetic spectrum, which ranges from radio waves to gamma rays. Electromagnetic radiation waves, as their names suggest are fluctuations of electric and magnetic fields, which can transport energy from one location to another. 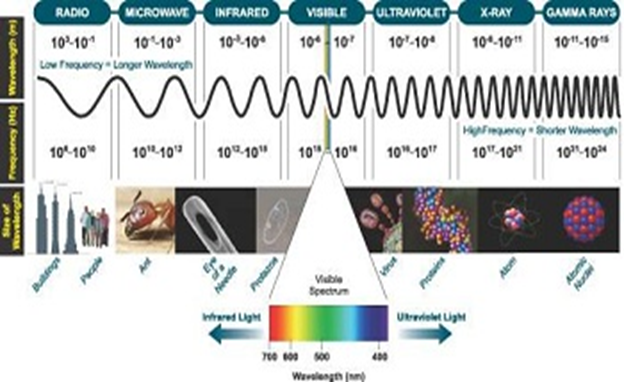 Visible light is not inherently different from the other parts of the electromagnetic spectrum. The exception being that the human eye can detect visible waves. The detection of light is an important tool for probing the universe around us. As light interacts with matter, it can become altered. By studying light that has originated or interacted with matter, many of the properties of that matter can be determined. It is through the study of light that we can understand the composition of the stars light years away or watch the processes that occur in the living cell as they happen. Hebrews 11:1-3 (KJV) – Now faith is the substance of things hoped for, the evidence of things not seen. For by it the elders obtained a good report. Through faith we understand that the worlds were framed by the word of God, so that things which are seen were not made of things which do appear. Colossians 1:16-17 (KJV) – For by him were all things created, that are in heaven, and that are in earth, visible and invisible, whether they be thrones, or dominions, or principalities, or powers: all things were created by him, and for him: And he is before all things, and by him all things consist. “His invisible perfections are manifested by his visible works, and may be apprehended by what he has made; Their immensity showing his omnipotence, their vast variety and contrivance, his omniscience; and their adaptation to the most beneficent purposes, his infinite goodness and philanthropy.” – Adam Clarke’s Commentary. The New Science – Which is the Old Science! The 20th century ushered in the age of quantum physics, often called quantum mechanics or quantum theory. Until that time, the world had run happily on Newtonian principles of physics, perhaps illustrated best by the law of gravity. However, by the beginning of the 20th century, the atomic age was being introduced. Physicists realized that the tiny sub-atomic particles did not react according to the theories put forth by Newton. Quarks are not particles in the physical sense, but energy. This discovery has broken the classical distinction between matter and energy. It now appears that in the material universe, only energy exists. What we call matter might be considered as just “frozen energy.” Quantum physics has turned up many weird and strange things – atoms can do several things at once. Physicists now know that atoms can penetrate impenetrable barriers. This has been demonstrated in the lab. What we perceive as our physical material world, is not physical or material at all, in fact, it is far from it. This has been proven time and time again by multiple Nobel Prize-winning physicists. 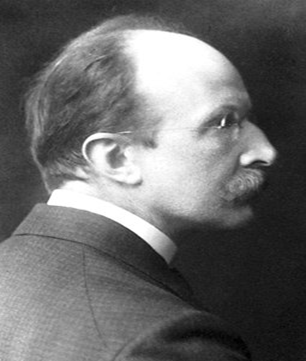 At the turn of the 19th century, physicists started to explore the relationship between energy and the structure of matter. Scientists began to recognize that everything in the Universe is made out of energy. Quantum physicists discovered that physical atoms are made up of vortices of energy that are spinning and vibrating, each one radiating its unique energy signature. If you observed the composition of an atom with a microscope, you would see a small, invisible tornado-like vortex, with some infinitely small energy vortices called quarks and photons. These particles make up the structure of the atom. As we focus in closer and closer on the structure of the atom, we would see nothing. We would observe a void. The atom has no physical structure. We have no physical structure. Physical things do not have any physical structure! Atoms are made out of invisible energy, not matter. The significance of this information is for us to wake up, and realize that we are all energy, radiating our unique energy signature. Feelings, thoughts, and emotions all play a vital role. Quantum physics helps us see the significance of how we all feel. If all of us are in a peaceful, loving state inside, it will no doubt impact the external world around us, and influence how others feel as well. Scripture also reflects this timeless principle: “For as he thinketh in his heart, so is he” – Proverbs 23:7. 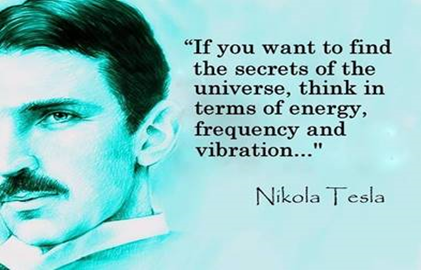 Nikola Tesla was a Serbian-American inventor, electrical/mechanical engineer, and futurist. Tesla is best known for his contributions to the design of the modern alternating current (AC) generators. Tesla discovered: alternating current, the Tesla coil, Florescent light bulbs, X-rays, radio signals, remote control, electric motor, laser, and wireless communications to name a few! Once, in 1899, Nikola Tesla had an interview with journalist John Smith, when Tesla said: “Everything is the Light.” Everything is connected by light and energy. There is also a very peculiar connection within the vast universe itself. 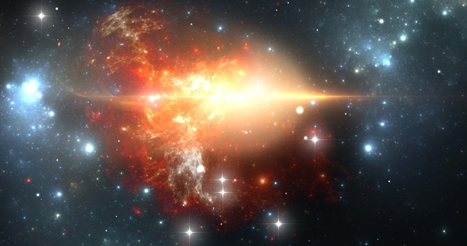 Although parts of the universe are separated by millions of light years, yet there seems to be an instant response between these parts, in what appears as a total violation of the speed-of-light barrier. How is it possible for the far reaches of the universe to respond together immediately? Well, scripture eludes to this idea by stating that the morning stars are singing together (Job 38:7). Quantum physics says that as we go deeper and deeper into the workings of the atom, we see that there is nothing there – just energy waves. It says an atom is actually an invisible force field, a kind of miniature tornado, which emits waves of electrical energy. Those energy waves can be measured and their effects seen, but they are not a material reality, they have no substance because they are… well, just electricity. So, science now embraces the idea that the universe is made of energy. 1 Thessalonians 5:5 – Ye are all the children of light, and the children of the day: we are not of the night, nor of darkness. Psalm 139:14 – I will praise thee; for I am fearfully and wonderfully made: marvellous are thy works; and that my soul knoweth right well. 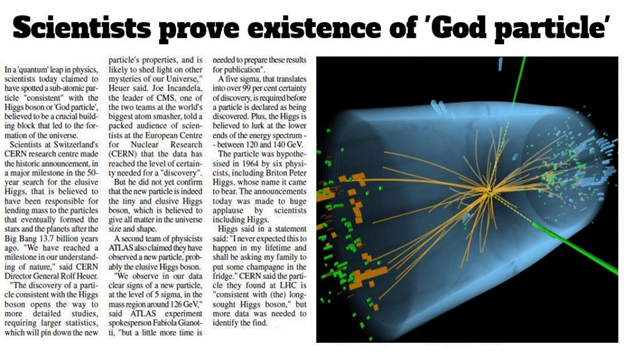 In Search of the “God Particle”! 1 Timothy 6:14-16 – That thou keep this commandment without spot, unrebukeable, until the appearing of our Lord Jesus Christ: Which in his times he shall shew, who is the blessed and only Potentate, the King of kings, and Lord of lords; Who only hath immortality, dwelling in the light which no man can approach unto; whom no man hath seen, nor can see: to whom be honour and power everlasting. Amen. Acts 17:28 – For in him we live, and move, and have our being; as certain also of your own poets have said, For we are also his offspring. Remember we said that the quarks, those energy packets, act in such a way that they might be described as “conscious.” Physicist Freeman Dyson, on his acceptance of the Templeton Prize, stated that: “Atoms are weird stuff, behaving like active agents rather than inert substances. They make unpredictable choices between alternative possibilities according to the laws of quantum mechanics. It appears that mind, as manifested by the capacity to make choices, is to some extent inherent in every atom.” What this means is that there is information behind matter. It is this information that precedes the material realm. 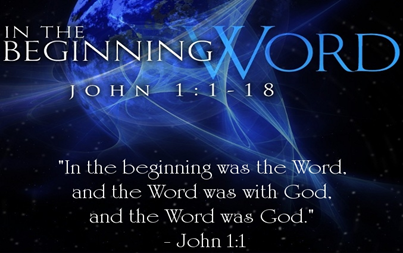 John 1:1-4 (KJV) – In the beginning was the Word, and the Word was with God, and the Word was God. The same was in the beginning with God. All things were made by him; and without him was not any thing made that was made. In him was life; and the life was the light of men. God's Land Promise to ABRAHAM - Fulfilled? This article is laid out very well where even a layman can understand. Every atom has its own resonant frequency which are the building blocks for all matter. The constant movement from negative to positive initiates a magnetic field that is the creative force that holds everything together. In our eco system our environment’s air is the positive; and the earth is the negative, to create the natural magnetic field. The earths frequency of 7.83 Hz is known as the Schumann resonance. Since man is made of clay it is not surprising that 7.83 Hz closely matches humanity’s alpha rhythm of their brainwaves. 5G technology radiates WI Gig levels of 60 GHz which will disrupt the orbital spin of oxygen molecules in our bodies. This gives our hemoglobin ability to bind with oxygen which gives us the ability to breathe. Once you understand that we are light beings then you can understand that 5G is detrimental to all life on earth. Thanks for taking the time to visit our website! Your comments are right on the mark.